The days of wasting group brainpower and hoarding knowledge are gone and in its place we have the collaborative workplace. This is theage of shared discovery. Collaborative office furniture forms a cooperative and supportive workforce by presenting company culture and values and an environment ready for teamwork. 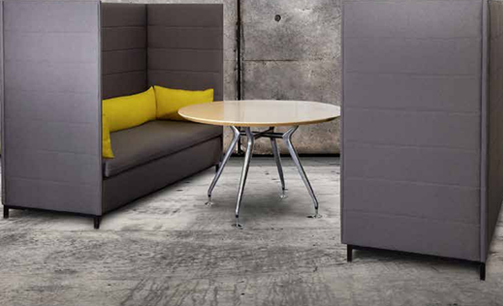 Office furniture is one of the key fundamentals in creating a collaborative work area. Individuals have the chance to work in an inclusive environment with collaborative seating, conference tables and modular workstations, which encourage teams, help release creativity and most importantly make working together easy, productive and enjoyable. Collaboration involves more than just the technology that supports it, also it means even more than a business strategy targeting the increase of experience and expertise in an organisation. Collaboration is most of all; a change in attitude and people’s behaviour throughout the office, especially when it comes to environment. To make collaboration a success there is a need of leadership and the willingness to work with a team incorporating the brain power of others. The most successful leaders of today guide their organisations with a shared purpose and vision. These leaders take on and communicate a future vision which impels people out of the boundaries and restrictions of the past. If the future vision is only known by the management, it is impossible for it to be effective as a motivator for the workplace. Yet with a work environment that cultivates collaboration with the aid of meeting spaces and furniture, the power of the vision pervades the employees’ workday and effectively comes true. Never underestimate the power of diverse thinking. Diversity makes people consider possibilities or perspectives that would otherwise have been overlooked. A group that thinks alike or is trained in similar disciplines with a similar knowledge base runs the risk of becoming narrow-minded and insular in their ideas instead of exploring alternatives. All collaborative outcomes depend on participants having well-developed personal relationships. Often in the rush to begin a project a team leader will put people together and tell them to “get to work.” Not allowing time for developing relationships can be a costly mistake as, more often than not, this approach proves to be unproductive. People need time to get to know one another, to build trust, learn each other’s strengths and weaknesses and to develop a common understanding and goal for the project. Without a workable environment for growing ideas and stimulating teamwork, any effort to transform business strategies won’t flourish. 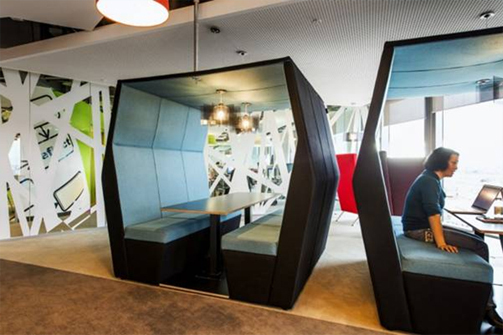 Collaborative office furniture isn’t just an aesthetical component for a contemporary office. It reinforces and strengthens company values while it generates a teamwork inspiring area for collective work.